Each of the Blue Octopus instructors brings a different interest, perspective, and capability enabling us to offer in-house instruction at nearly all diver levels. Whether you want a basic scuba certification to see a colorful fish on a shallow reef, make deep ocean dives, or forge through the underwater labyrinth of caverns and caves, we are able to provide these training opportunities. Want to join our team? Join us March 7th, 2018 at 6pm for our next Go Pro night. Mike started diving in 1994, earning his Open Water certification while stationed in Keflavik, Iceland. The following year Mike discovered warmer seas in Puerto Rico, at which point he earned his Advanced Open Water. After traveling around the world due to being active duty military, Mike finally completed his Rescue diver in 2012, with his Divemaster following immediately behind. He did not stop there and in 2013, he went on to earn his Instructor up to the level of MSDT. In addition to being an experienced diver, Mike also dabbles in the service side of diving. He is currently certified to service Sherwood, Poseidon, Zeagle, Hollis, Oceanic, Dive Rite, Atomic, SEAC and IST. Some of the places Mike has had the opportunity to dive are Iceland, Scotland Loch Nest, Puerto Rico, St. Croix, St Lucia, Grand Bahamas Island, Exuma, Grand Cayman, Aruba, Bonaire, Venezuela, Honduras, Cozumel, Hawaii, Belize, Florida and Keys, and last but not least New Jersey. Finally, while all divers have their favorite gear, Mike is no different. The following are some of his favorite pieces of gear: Dive Rite Trans Pac and back plate; Zeagle Ranger; Poseidon regulator; Shearwater Patrel computer; OMS slip stream fins, Atomic Viper mask with SV2 snorkel; wet and drysuits by Waterproof; and lastly the SeaLife micro HD point and shoot camera. As you can see, he has a plethora of knowledge he can share to enhance your diving experience. Current certifications include: Boat, Deep, Navigation, Drift, DPV, Search & Recovery, Dry Suit, Night, Digital Underwater Photography, Cavern, Side mount, and Rebreather. As an avid wreck diver, my favorite dives have been to Bikini Atoll’s sunken fleet and our annual mid-summer excursion (Join us!) to North Carolina’s Graveyard of the Atlantic. While cave diving and technical decompression diving (and now even Fish ID) are great fun, teaching divers from their first breaths underwater in a Discover Scuba program to professional level divemasters and instructor development are the most rewarding for me. Questions about training, equipment, travel or just diving, always glad to talk scuba. Janet Clayton is the store manager and Master Scuba Diver Trainer and Emergency First Responder Instructor. Janet fell in love with scuba diving when she took a discover scuba class in Mexico. After becoming a certified diver, in 2011, Janet could not wait to get back in the water. She became a PADI Open Water Instructor, earned the rating of Master Scuba Diver Trainer and is passionate about diving, teaching and preserving the environment or future generations. She dives by the motto “leave the stress at work and dive, dive, dive”. Ron started diving in 1980 while a graduate student in oceanography and has been an avid diver ever since, becoming an instructor in 2005. Although he loves diving the clear warm waters of the Caribbean (just say the words Fl Keys, Bonaire or Cayman, and he's in! ), he also loves Northeast diving and the local quarry. He also makes several trips a year to Morehead City North Carolina to dive the wonderful wrecks there. Ron loves teaching basic open water, advanced open water, or any of the specialties that can be done on the trips he leads. His teaching specialty is Nitrox, where is is always eager to explain and derive all the equations for the rare student who wishes this level of detail. Ron leads our extremely popular Fl Keys trips, with shallow, warm-water diving, lots of key lime pie, and at the right time of the year, lobster hunting (and eating). In addition to the Keys, he leads a Bonaire trip every winter. However, nothing makes him happier than when a former student calls him and says "let's head out to the quarry and go diving" (Yes, he loves the local quarry). Over 30 years Diving Experience Love the underwater world and introducing others to its fascinations. There are always new discoveries and adventures and scuba divers are a fun bunch, friendly and socially engaging. Jessica Johnson is a PADI Open Water Scuba and Emergency First Responder Instructor. Jessica’s love for the water started young as she began swimming before she was walking. Fascinated by everything with the water learning to scuba dive was her childhood dream. After becoming a certified diver, in 2001, her first dive vacation was to Bonaire where she was blown away. Breaking the surface and seeing a vibrant reef and all the life it held it solidified her love for the water and ignited a passion for diving. She became a PADI Open Water instructor as a way to help others discover the wonders that lie beneath the surface. As a proud auntie of fourteen she understands the unique needs of children and brings that knowledge to each class as shares her love of diving with children of all ages from 8 to 80. Although Jessica has traveled all over the world to dive, Bonaire has special place in her heart, don’t believe it just ask her or better yet join her on a trip!! She is passionate about diving and preserving the environment or future generations. She dives by the motto “leave only bubble and take only memories (or pictures)”. MSDT Instructor, NAPD Instructor, UDT Master Instructor, Blackwater Archaeology, Mark V Diver, Full Face Mask, Drysuit, Wreck. I learned to dive in 1985 while taking a college class and fell in love with diving ever since. Really enjoy working underwater archeology projects as well as wreck diving. The next thing I would like to do is become a full cave diving instructor. Curt started diving at the age of 14 in the mountain lakes of West Virginia, and has never looked back. Curt has been a PADI Instructor for over 25 years, and wrote his own Dry Suit Specialty Course way back when it was considered a "Distinctive Specialty" (parts of the course he wrote were used in the standard PADI materials). Curt has been known to dive any place and under any conditions "so long as the water is still liquid". Curt has led diving trips all over the world, including annual trips to Cozumel since 1988, many trips to Australia's Great Barrier Reef, Indonesia, Papua New Guinea, Micronesia, the Galapagos Islands, and most Caribbean locations. PADI Instructor, EFR Instructor, & BOS's Webmaster. AOW, Rescue, Master Scuba Diver, Drysuit, Ice Diver, Enriched Air, Heliotrox, Archeology, Archeology Field Training, Wreck, Deep, Sidemount, Self-Reliant. Learned to dive while on business in Jupiter, FL but really got hooked on New England wrecks. Love diving where I can see anything big: wreck, sharks, turtles & eels or where I can bring something home, like lobster or Megalodon teeth. Took 12 years off while my kids were growing up and now the whole family dives together. Most recently started working with archaeology groups including MAHS and BAREG. I’ve dove along most the east coast and took NITROX & sidemount so I can stay longer and see more. Favorite trip was CocoView Resort, Honduras where I proposed to my wife underwater. I didn’t lose the ring and she said yes. Someday I’d like to dive the Bikini Atoll. Don took his first discovery dive over 20 years ago in Oahu, HI and was immediately hooked. Since that first dive, he’s dived in beautiful and exotic locations around the world, from all borders of the USA, and multiple trips to Hawaii, Asia and the Caribbean. Don’s interest is leading “long-weekend” dive vacations to the Caribbean and other nearby locations. His passion for travel is only exceeded by the pleasure he receives from working with new divers. Tuck is now located in Mississippi but still runs classes through Blue Octopus Scuba. Look for "BOS - South" to see his classes. Tuck fell in love with the water as a child. Instead of doing homework, he drew SCUBA divers. He took the paycheck from his first job and paid for SCUBA Lessons, becoming a diver officially in 1985. Tuck dove in FL and NC before beginning his current "real" job as an Army Engineer in 1987. (yes, he finally got his homework done) Since then, He has an extensive dive history to include locations like New England for Lobsters, The Caribbean, Germany, as well as the Red Sea off Egypt. Someday he wants to do a "Live Aboard" cruise on the Great Barrier Reef off Australia. Tuck Joined Blue Octopus SCUBA in March 2016 where he gains great joy watching eager students cautiously enter the water, only to leave as confident comfortable divers ready to enjoy the wonders underwater. TJ was certified in 1998, at age 16, with his family before going on a trip to Venezuela. He has primarily been diving in the Caribbean and the Florida Keys, however has most recently returned from Hawaii, Kwajalein (Marshall Islands), and diving off the coast of North Carolina. Some of his favorite underwater creatures are Turtles, Goliath Groupers, and Puffer-fish. TJ has been a PADI Divemaster since January 2013 and finished his Assistant Instructor in 2017. He hopes to travel to Australia, Thailand, and Bonaire in the near future and looks to continue his education by taking the Tech-40 and cavern diver courses. Brian is a PADI Assistant Instructor. He has been a certified diver for over 11 years. 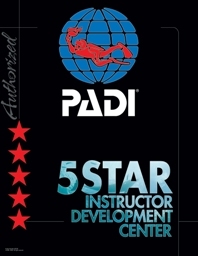 He holds certifications from PADI, SDI and NAUI. Brian has been a professional diver for over six years working with students ranging in age from 10 years old to over 70 years old. Brian was introduced to Scuba diving through a series of discover scuba dives in Hawaii. During the last discover scuba dive he and 6 other divers that he was with encountered three humpback whales. Brian has dived Hawaii, the North Carolina Coast and the St. Lawrence river water way. Brian is huge fan of wreck diving and plans to pursue this interest as a Tech diver. Erik began his diving career as a child using his parents’ vintage snorkeling equipment off their boat in Navajo Lake, New Mexico. With the urging of his mother and father, he was certified through a local dive shop in Albuquerque, NM, completing the open water portion at a local spot known as “Blue Hole”. It was this newly-found skill that influenced his decision to serve in the U.S. Coast Guard, thus living in and diving the waters of Hawaii, California, and the Florida Keys. During a military tour in the DC area, Erik gained shop experience and furthered his diving career while experiencing multiple training dives in the Millbrook Quarry, as well as enjoying dive trips to the Bahamas, the Keys, and Culebra, PR. I grew up around the water and have always loved the water. I first fell in love with coral reefs when I was nine in Hawaii. From then on, I was hooked. I did discover scuba when I was in high school. After my first breath underwater, I couldn’t get enough. I finally got certified the summer of 2017. I love the feeling of being surrounded by water. Sea of Cortez has been my favorite dive site so far. While there I saw a hammerhead shark on one of the dives and was able snorkel with whale sharks.